Ishestar is a tour operator with over 30 years of experience specializing in riding holidays in the amazing unspoilt nature of Iceland. Iceland is one of the least densely populated countries in the world, with a total population of 320.000 people. The vast uninhabited highlands are a treasure and the most authentic way to travel the trails of the Vikings is on horseback. 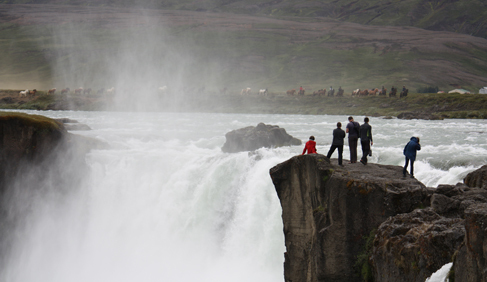 Amongst the unique tours on offer are; Riding under the Northern lights, exploring the hot springs area at Geysir and the glorious waterfall Gullfoss, joining local farmers driving herds of horses or gathering sheep in the highlands and beach rides. Ishestar is originally a family company and all their tours are operated by local farmers who know the horses and landscape like the back of their hand. The atmosphere on the tours in friendly and fun and we focus on security, professionalism and sustainability. Ride Iceland on the Northern Exposure Tour, nominated by the Sunday Times as one of the 10th best trails in the world. The North of Iceland is known for its spectacular natural sights and diverse landscape. This riding tour goes to the Lake Mývatn area, famous for its volcanic features and rich birdlife, Europe’s largest waterfall, and strange rock formations are just some of the gems of nature we´ll be seeing on this amazing tour. Learn more about this 5 day/ 5 night Icleand vacation. Another epic riding vacation, consider also riding around Mount Hekla, a highly active volcano often titled the “Queen of Iceland" on the Landmannalaugar Tour. The mountain towers regally over the region and every day we see evidence of its numerous devastating eruptions throughout the ages. In the old times, people actually believed it to be the gateway to hell. Landmannalaugar is a geothermal wonderland in the Southern Highlands. It’s natural bathing pools are only one of the highlights which make this area one of Iceland’s most popular destinations for nature lovers. Learn more! Email Heiddis. Visit Ishestar's website. The breed is best known for its four-beat smooth gait, the “tölt”, which is very comfortable for the rider, especially on a longer riding tour. 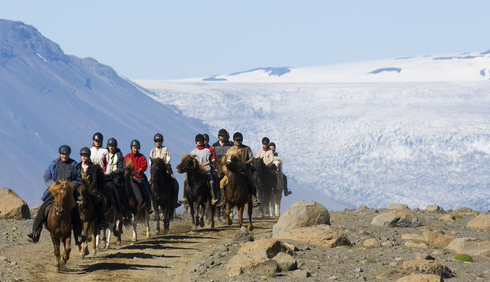 Riding an Icelandic horse in its native habitat is an authentic riding experience. 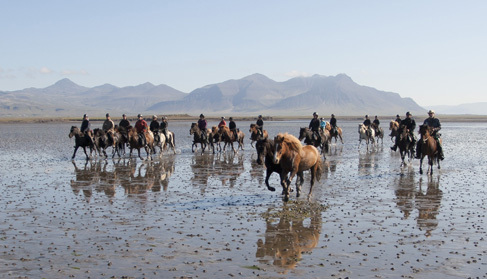 Riding alongside a free running herd is traditional when traveling on horseback in Iceland. On longer tours riders change horses at least once a day and therefore experience a variety of horses. Iceland is the least densely populated country in Europe, with pure, unpolluted and truly magical landscapes. In Iceland (and on the Ishestar riding tours) you can find hot spring oasis featuring hot pools and geothermal hot springs that are perfect for relaxing after a long riding day. 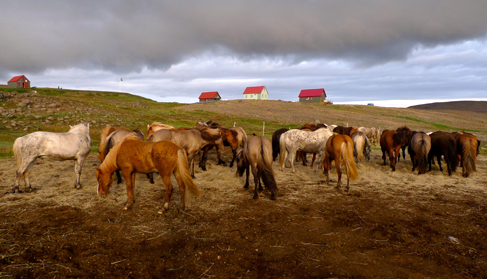 Accommodations on these Iceland riding tours range from sleeping bags in mountain huts to hotel accommodations. Homemade Icelandic food prepared with pure ingredients. Menus consist of a large breakfast and traditional Icelandic fish or meat. Vegetarian meals are available if requested in advance. All riders make their own packed lunch from the breakfast table. Waterfalls, glaciers, pristine nature, nature baths, volcanoes, highland trails and more. Explore Reykjavik, Iceland's capital city, snowmobile on a glacier, see the Northern Lights and more. 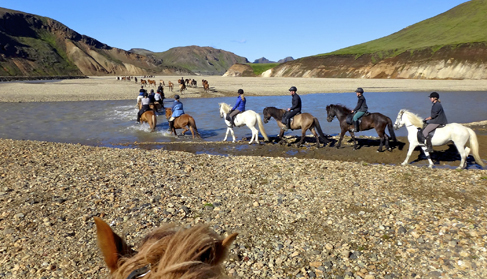 Ishestar has been leading Iceland horse riding tours since 1982, taking you through beautiful nature with waterfalls, geothermal hot springs and glaciers on Icelandic horses. All over Iceland. 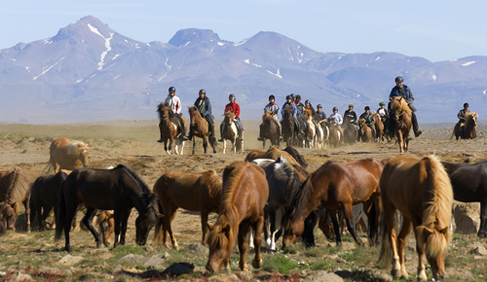 The riding center is located just outside the town of Hafnarfjörður, about 10 minute drive from Reykjavík. This Riding Vacation Provider works with Travel Agents!